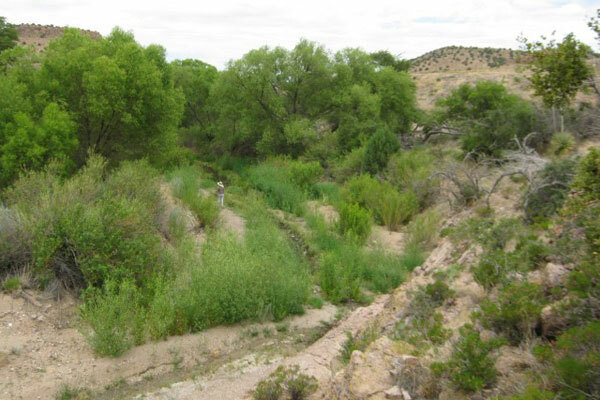 Restoring and maintaining natural processes is essential to reestablishing resilience and vigor within any watershed and its component elements: hill slopes, terraces, stream channels and wetlands. Learning the workings of the watershed and ciénaga and applying restoration techniques most appropriate to conditions can be complex, yet feasible. 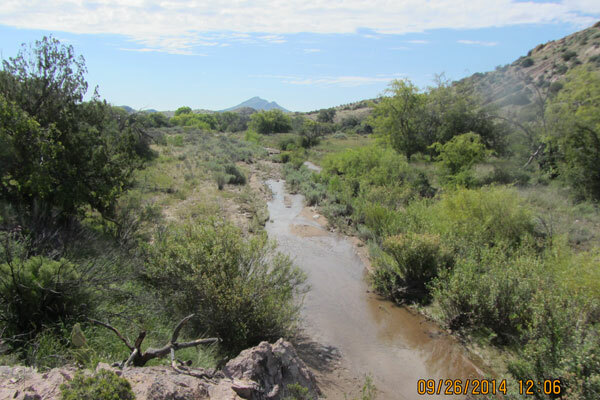 Restoration aims to reverse the erosive processes at work over the last 200 years. During the last several years, much has been learned about the most effective and cost-effective means of achieving watershed and ciénaga restoration. Documenting restoration results is important. It quantifies changes as a result of restoration, identifies what works — and what doesn’t — and provides evidence to agencies or organizations that provide funding. 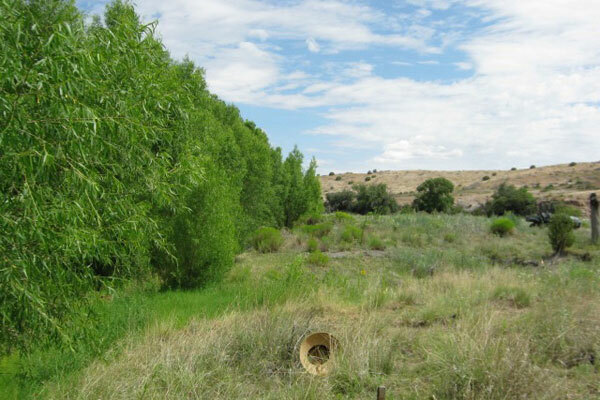 Documentation demonstrates what we have learned and conveys the results of these habitat restoration techniques to encourage others to similar efforts on land to which they have access, whether by way of ownership, rental property or volunteer work. 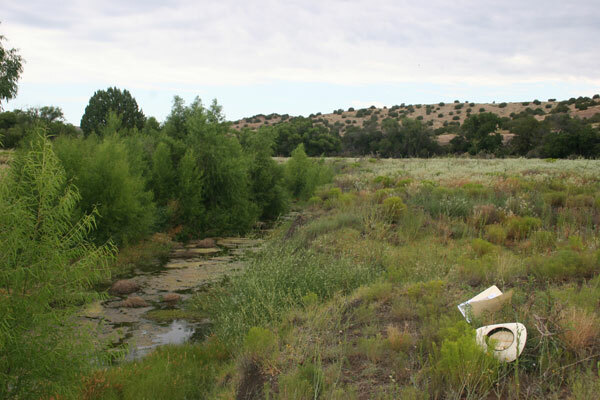 For example, the machine-built "Zuni Bowl" shown in the Habitat Restoration section and below was constructed in 2005. Zuni Bowls are in-channel head-cut control structures, boulder-lined plunge pools that dissipate flood forces, slow water, and capture suspended sediment. This Zuni Bowl has been renovated three times and is now double its original size. The incised channel here has aggraded with new sediments, the continuation of which will eventually allow flood waters to reach and wet the water-starved terraces along the sides of the incised channel. The machine-built Zuni Bowl at Bobby’s Crossing shows an in-channel head-cut control structure made of boulder-lined step falls and plunge pools that prevents the incision process and slows and dissipates the energy of water by pouring it into a rock bowl. The bowl then captures suspended sediment in water flows and aggrades the incised channel, eventually eliminating the incision and allowing the water to eventually — after the addition of more tiers atop this structure — access the terraces currently along the sides of the incised channel. 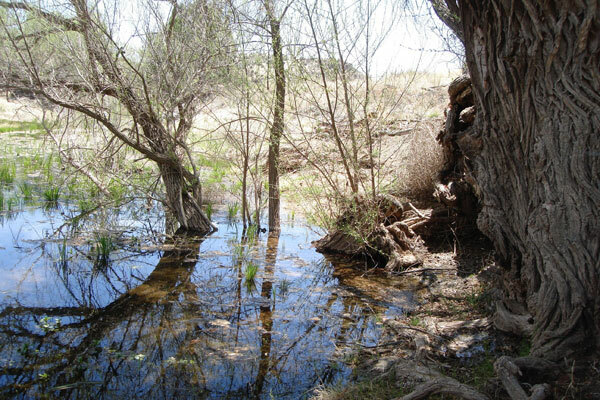 The photograph on the left shows the water level at the Willow Pond at mile one of the nine-mile reach of the Burro Ciénaga on the Pitchfork, taken in 2007. The 1.5-mile reach of the watercourse at the top of the ranch was historic ciénaga, now severely incised, yet with perennial water. The photograph on the right was taken the following year after restoration and rain. This pair illustrates the change in water level over a period of just one year. 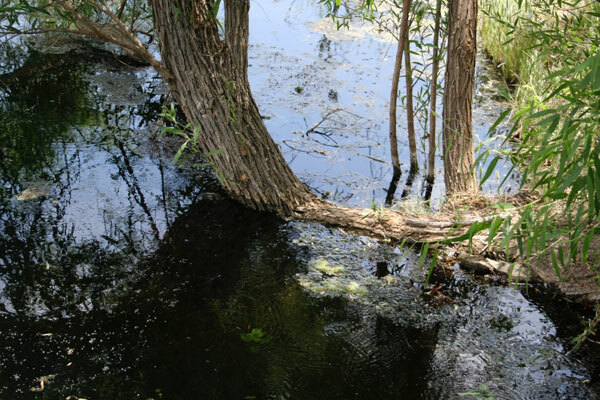 The “elbow” of the willow branch in the left photograph is above the water level by at least an inch. In the later photograph, the elbow is 11 inches below the water surface, an elevation of the water level of one foot, suggesting the floor of the watercourse has collected sediment and elevated similarly. 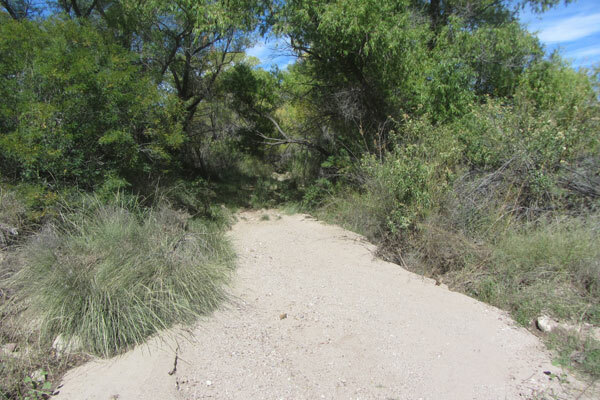 This pair of photographs with the white hat near a small mesquite bush were taken down-channel of the Willow Pond, the one on the left after the first restoration in 2005, the photograph on the right taken in 2010 after restoration in the channel and removal of the cattle that kept the willow trees eaten back. Recording pressure tranducers are small monitoring instruments suspended inside shallow, hand-installed monitoring wells. Each well extends below ground surface through the water table, and its transducer is suspended deep enough to record even the lowest water levels during dry periods. The ciénaga water table level is sustained by perennial spring seepage, but also responds to the stage (elevation) of varying surface flows through the Burro Ciénaga channel. 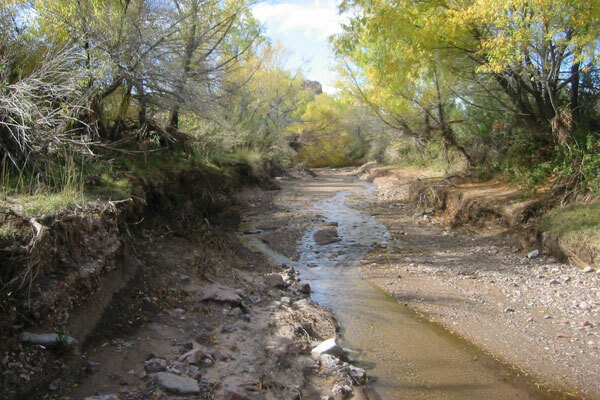 As restoration work helps to slow surface runoff and capture fine sediments in the channel bed and banks, groundwater storage capacity improves. Average surface stage also rises in response to aggrading conditions in the channel and floodplains. Hourly water level and temperature data collected continuously over a period of several years document trends in groundwater storage and elevation; topographic mapping helps establish links between groundwater trends and changing channel morphology over time. 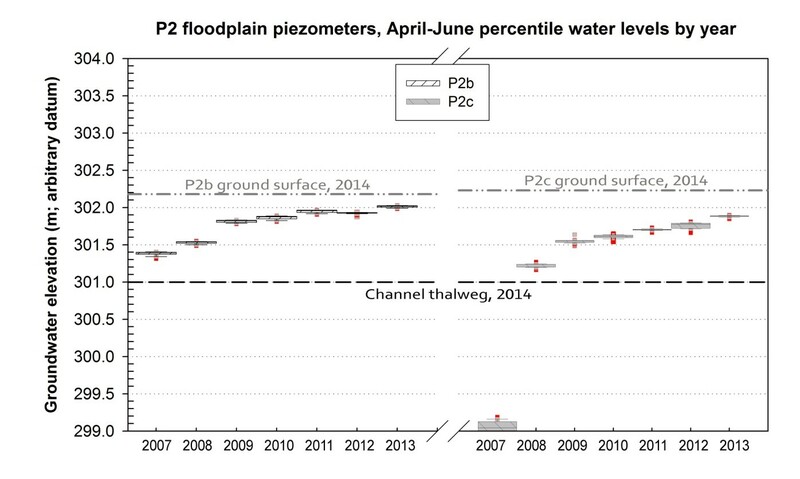 The above chart shows the annual percentile groundwater levels (box plots) from two floodplain wells (P2b and P2c) on transect P2, 2007-2013, from hourly transducers data. Water levels depicted by each box are shown relative to the elevation of the Burro Cienaga channel bottom (thalweg) and the ground surface level at each well. Water levels are in meters (m), relative to an arbitrary elevation control datum established for the surveys. These data were collected during the typical dry period each year, April–June. Average groundwater levels in both wells increased almost every year, despite large differences in watershed precipitation during these months among years. For instance, in 2011, zero precipitation was recorded in the watershed. 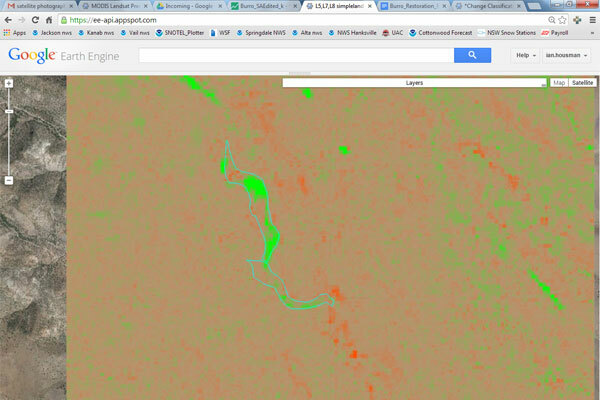 Repeat mapping of the channel and floodplains around transect P2 in 2007 and 2014 documented aggradation of nearly 50 cm, corresponding with rising groundwater levels. 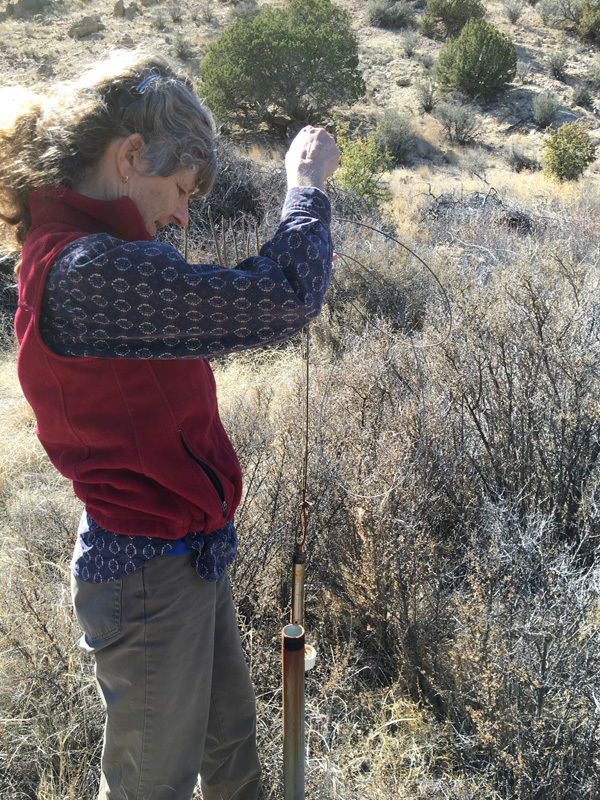 Ellen Soles removes transducers from well to collect data. 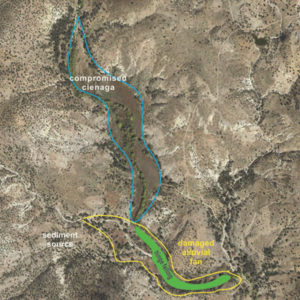 The Google satellite map image below, modified slightly, is taken from Bill Zeedyk’s Characterization and Restoration of Slope Wetlands in New Mexico: A Guide for Understanding Slope Wetlands, Causes of Degradation and Treatment Options. 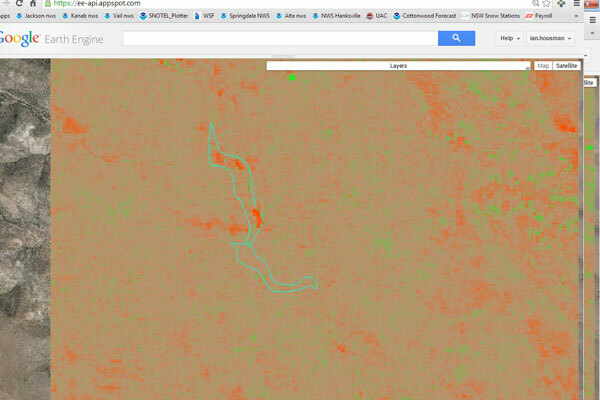 This satellite map image portrays abandoned agricultural fields that were created by landscape recontouring that channelized the surface flows — to the left on the image, down channel right — once dispersed throughout the historic "compromised" ciénaga area, outlined in blue. Willow trees, an early succession species, now line the channel incised through the ciénaga. The damaged alluvial fan (bright green area inside the yellow outline) was deposited over centuries from its sediment source in Horse Canyon. Zeedyk believes the alluvial fan provided the "cork" or base level control for the ciénaga. Intense storms generated floods in Horse Canyon that eventually scoured and eroded through the fan, removing this base level control and exacerbating incision through the ciénaga. The red and green pictures in the center and on the right below are modified satellite images illustrating moisture (green) or dryness (red). The outlined areas are the same as those in the left image. 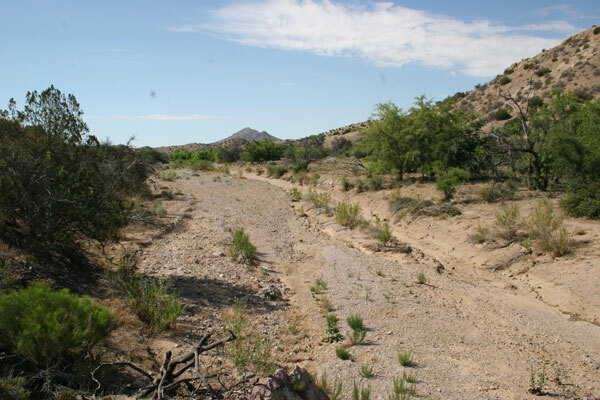 The center image illustrates the dryness of the area in 2003, before restoration work began. The right image, from 2014, clearly illustrates much wetter conditions, especially within the Burro Ciénaga channel zone where the most intensive restoration work has been focused. 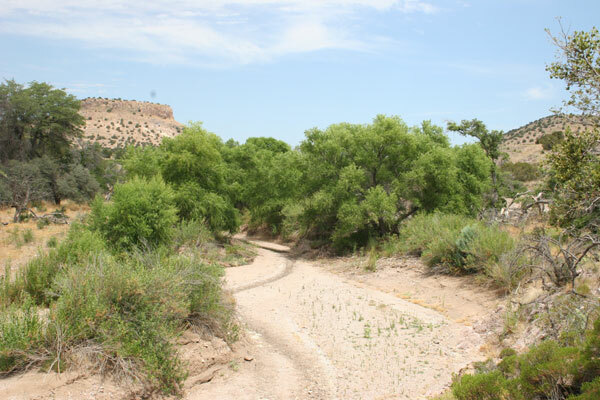 These images also illustrate the difficulty in quantifying change resulting from restoration versus current climate conditions. Note the two faint green dots in the 2003 image compared with the changes in the 2014 image; these are dirt tanks for cattle. No restoration work has been completed at the tanks, although the cattle have been removed.